The Buckingham family had been in Connecticut several generations by the time William A. Buckingham was born on May 28, 1804 in Lebanon, Connecticut. Thomas Buckingham, the first of the family in America, helped to settle the New Haven Colony in 1638. One of his sons, also named Thomas, was ordained pastor at the Congregational Church in Saybrook. It was here that Samuel Buckingham, William’s father, was baptized in September of 1770. He married Joanna Maston of Lyme on March 8, 1798. In 1803, the family moved to Lebanon, where William, the second of six children, was born the next year. Lebanon was well known as the home town of the three Trumbulls who had earlier become governors of Connecticut. The Buckingham house was described as being “among the best in the town, standing under lofty shade trees, with a plenty of fruit trees about it, and a good farm attached.” 1 Here William grew up and attended the local village school as a child. He went on to attend the Bacon Academy in Colchester, where he studied land surveying. As a young man, Buckingham moved to Norwich to work in a dry goods store which was owned by his uncle, Giles Buckingham. He spent a short time working in a wholesale store in New York City, but by 1826 he was back in Norwich where he established his own dry goods business. In 1848, he left the business and helped form the Hayward Rubber Company, serving as its manager and treasurer. On September 27, 1830, Buckingham married Eliza Ripley, daughter of Dwight and Eliza (Coit) Ripley of Norwich. They had two children, William Ripley Buckingham, born October 27, 1836; and Eliza Coit Buckingham, born December 7, 1838. William Ripley died in early childhood on December 12, 1838. Their daughter Eliza married William A. Aiken on August 28, 1862. They had six children. General Aiken would later serve as a member of Buckingham’s staff during the Civil War. Buckingham was active in Norwich politics as a Whig, and he served several terms as mayor. In 1857, he was considered as a candidate for governor on the Union ticket, but a storm kept some of his supporters from attending the nominating convention in New Haven, and he lost in a close vote to Alexander Holley, who went on to win the election. In 1858, the American and Republican parties, which made up the Union slate of candidates, could not agree on whom to run for governor. Buckingham was chosen as a compromise candidate. He defeated the Democratic candidate, James T. Pratt, gaining 36,298 votes compared to Pratt’s 33,544 votes. Buckingham would be reelected annually for seven more years, though the 1860 election proved to be very close. In that year, the Democrats nominated Thomas H. Seymour as their candidate. Seymour had already served four terms as governor (1850-1853) and was a popular choice. 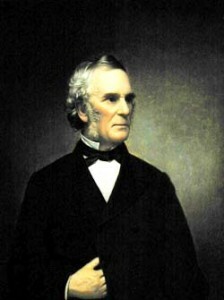 1860 was also the year of the Presidential election, and national matters over slavery and state’s rights were the focus in the Connecticut election. Seymour sympathized with the southern states’ concerns and was opposed to the Union cause. In contrast, Buckingham was against the extension of slavery and was strongly pro-Union. The intense race was decided by just 541 votes, with Buckingham earning 44,458 votes to Seymour’s 43,917. In every subsequent election for governor, Buckingham managed to receive over 50 percent of the popular vote. The major reason for Buckingham’s long tenure as Connecticut’s governor was the outbreak of the Civil War. He was a strong supporter of Abraham Lincoln. The two met when Lincoln campaigned in Connecticut as Buckingham’s guest, and a personal friendship formed between them. When the President called on the Northern governors to assist him in prosecuting the war, Buckingham became Connecticut’s leading catalyst for this purpose. He worked seven days a week, twelve hours a day. He was the state’s major correspondent with the Federal government, and he read and answered letters from troops in the field and visited troops at war as well as at home. He oversaw much of Connecticut’s procurement of men and materials for the war, and he spoke at meetings and rallies around the state. Buckingham was very concerned for the welfare of Connecticut troops. He is quoted as saying to an official in Washington: “Don’t let any Connecticut man suffer for want of anything that can be done for him. If it costs money, draw on me for it.” 2 In all, it is estimated that Connecticut sent 54,882 soldiers to fight in the Civil War.3 In 1862, the United States Congress passed an act allowing for the enlistment of colored soldiers, and in November of 1863, Buckingham persuaded the Connecticut General Assembly to authorize a state regiment of black soldiers, the first of which was to be the Twenty-Ninth. Buckingham received more power and freedom of movement from the General Assembly than it allowed nearly all of the other nineteenth century governors. In this sense, his position was similar to that of Jonathan Trumbull, Sr. during the period of the American Revolution. Like Trumbull, Buckingham is known as a “War Governor” for his work. Buckingham was elected to the United States Senate and began his term in March of 1869. On February 5, 1875, he passed away. Governor Charles Ingersoll issued an executive order to honor the man who “for eight years continuously filled the executive office of this state with high distinction, and whose death, while a senator of this state in the congress of the United States, has, by reason of his personal virtues, as well as by his long-continued public services, caused a profound sorrow throughout the state… ” 5 Buckingham is buried next to his wife Eliza in the Yantic Cemetery in Norwich. Buckingham was a benefactor of Yale College and served as president of the Board of Trustees of Norwich Free Academy and as president of the Connecticut State Temperance Union. The house where Buckingham was born and the one where he lived as a youth are still standing in Lebanon, both of which are privately owned. His house in Norwich is owned by the city and is listed on the National Register of Historical Places. A street and school are named in his honor in Norwich, and astatue of him is inside the State Capitol Building in Hartford. 1 Buckingham, Samuel G. The Life of William A. Buckingham, p. 7. 2 Norton, Frederick Calvin. The Governors of Connecticut, p. 254. 3 Connecticut Adjutant General’s Office. Annual Report of the Adjutant General of the State of Connecticut for the Year 1866, p. 6. 4 Buckingham, William A. Manuscript letter of 1868. 5 The Daily Constitution (Middletown), February 8, 1875, p. 2. Buckingham, Samuel Giles. The Life of William A. Buckingham, The War Governor of Connecticut. Springfield, MA: W. F. Adams, 1894 [CSL call number E 499. B92]. Buckingham, William A. Autograph letter [to O.H. Perry] on death of wife, 1866 [CSL call number Main Vault 920 B856p]. Chapman, F. W. The Buckingham Family; or the Descendants of Thomas Buckingham… Hartford, CT: Press of Case, Lockwood & Brainard, 1872 [CSL call number CS 71 .B923 1872]. Caulkins, Frances Manwaring. History of Norwich, Connecticut: From Its Possession by the Indians to the Year 1866. Chester, CT: Pequot Press, 1976 [CSL call number F 104 .N93 C3 1976]. Dana, Malcolm. The Norwich Memorial: The Annals of Norwich, New London County, Connecticut, in the Great Rebellion of 1861-65. Norwich, CT: J.H. Jewett and Company, 1873 [CSL call number F 104 .N93 D3 1873]. “The Dead Senator.” The Daily Constitution (Middletown), February 8, 1875, p. 2, digital images, Early American Newspapers 1690-1922(http://www.newsbank.com/readex/index.cfm?content=96 : 27 Jan 2009). Finan, W. J. “William A. Buckingham, Civil War Governor of Connecticut.” The Lure of the Litchfield Hills. vol. XXI:1. Winsted, CT: Litchfield Hill Federation, 1929-1975 [CSL call number F 102 .L6 L8 oversize]. Highways & Byways of Connecticut. Hartford, CT: G. Fox & Co.,  [CSL call number F 94 .H54 1947]. Lane, J. Robert. A Political History of Connecticut During the Civil War. Washington, DC: Catholic University Press of America, 1941 [CSL call number F 99 .L25 1941]. Niven, John. Connecticut for the Union: The Role of the State In the Civil War. New Haven, CT: Yale University Press, 1965 [CSL call number E 499 .N5]. National Cyclopedia of American Biography. New York: James White & Company, 1898- , s.v. “Buckingham, William Alfred”, vol. X, pp. 349-40 [CSL call number E 176 .N27]. Norton, Frederick Calvin. The Governors of Connecticut. Hartford, CT: The Connecticut Magazine, 1905 [CSL call number F 93 .N88 1905]. “Obituary. The Hon. William A. Buckingham.” The Daily Constitution (Middletown), February 5, 1875, p. 2, digital images, Early American Newspapers 1690-1922(http://www.newsbank.com/readex/index.cfm?content=96 : 27 Jan 2009). Porter, Noah. “Memoir of the Hon. William A. Buckingham, LL.D.” New England Historical and Genealogical Register, vol. 30. Boston: New England Historic Genealogical Society, 1876 [CSL call number F 1 .N56]. State Archives Record Group 005, Records of the Governors. (http://www.proquest.com/ : 27 Jan 2009). “Tribute to the Noble Dead.” New York Evangelist, July 3, 1884, p. 4, digital images, American Periodical Series Online (http://www.proquest.com/products-services/aps.html : 27 Jan 2009). 48” x 41” in its frame, painted by Alexander H. Emmons. Another portrait of Buckingham is in storage and was on display until 1880, when it was determined by Buckingham’s family that the present one was a better likeness. Originally prepared by David O. White, Museum of Connecticut History, Connecticut State Library. Edited and revised by CSL Staff, June 2009.